Portovenere is a charming and picturesque town in the Bay of La Spezia. The town has a very strong connection to both the military and the sea, reflected in the two centers of the town. The first ist he old port, the second the fortified, Genoese stronghold, where you'll also find the Church of San Lorenzo, which was constructed in Gothic-Renaissance style, similar to the Genoa Cathedral. The streets of Portovenere contain numerous other examples of medieval architecture. Restaurants were not open when we had free time and bathroom facilities were a little difficult to find. But beautiful, beautiful area. We took the first part of the guided tour and enjoyed the view from the watercraft. After we were set on our own for free exploration, we informed our guide that we were going to go back to La Specia on our own. 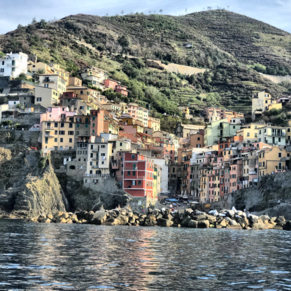 We hiked between Vernazza and Monterossa on our own and loved the experience! Then took the train back to La Specia and a cab to the port. Very easy to arrange and we had plenty of time to get back to the ship. There are currently 0 discussions about Portovenere, Italy.